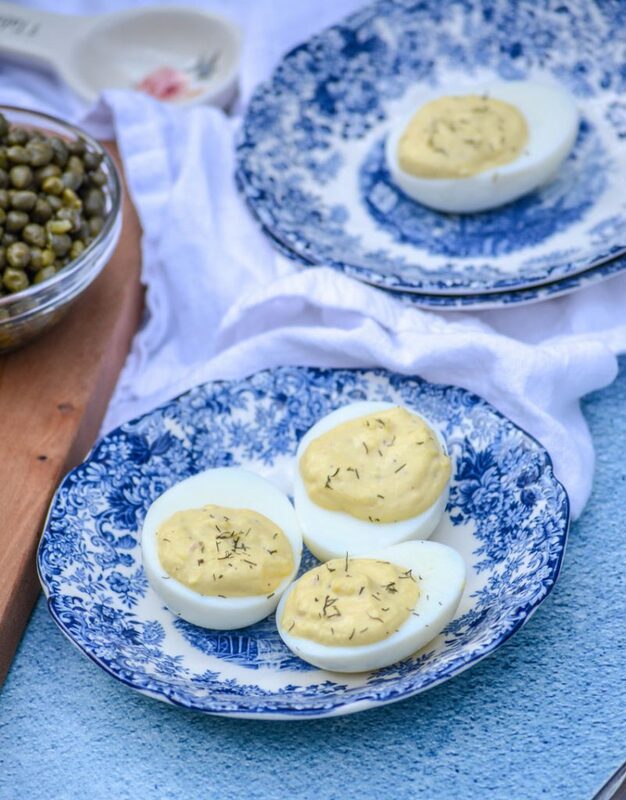 Fancy sounding as they may be, these French-Style Deviled Eggs are super simple & a snap to whip together. 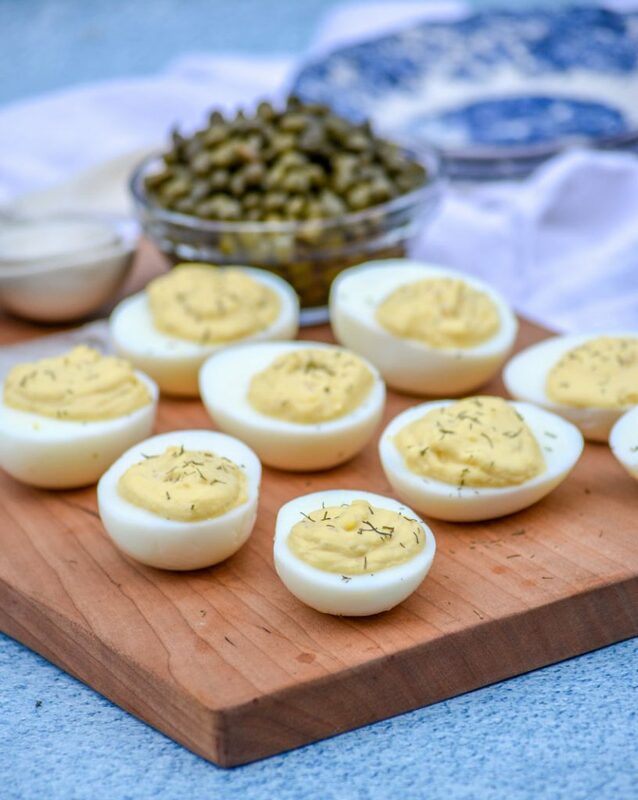 Last minute, or made hours ahead of time, they’re the next big thing to happen to deviled eggs. You’re gonna want to serve them at every party or potluck you host. 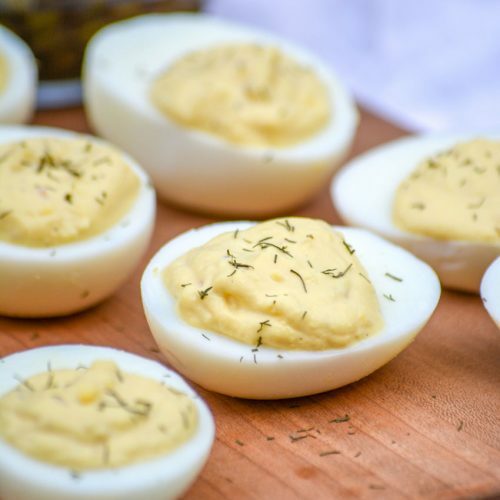 What is it about deviled eggs and parties? The two just seem to go hand in hand. Parties, and family get-togethers. The two occasions the sons know we’re guaranteed to have them at. This version of the classic features ingredients that remind me perfectly of a quality French vinaigrette. Dijon mustard, red wine, and shallots together in one dish … oh yes! Plenty of bold flavors that work well together….and a variety of textures so you don’t get bored! Not that you would get bored when you’re eating it at a party, but that’s beside the point. As the holiday season continues, the sons’ will continue to enjoy this family fav. I will enjoy it as well, as long as the windows are open. I smell enough phantom (and real farts) from them, without the added sulfurous mix of boiled eggs. Even son # 2 who previously hated deviled eggs and avoided them at all costs, while the other sons’ were busy fighting over who’d claimed his uneaten share, will enjoy them. The first time I made these, he ate 5 of them! Even he couldn’t get over it. So basically, these really need to be a part of your life, like, immediately. Especially the holiday party, get together with all the relatives-ing part. Just make these ahead of time so nobody chokes on a thick cloud of air freshener. Don’t be put off by their fancy name either. Just because the ‘French’ bit makes them sound gourmet and probably hard to make; they’re not. At the end of the day they’re just deviled eggs. A basic enough recipe, with a couple of higher end ingredients mixed in. These mix-ins lead to fuller flavor, and an even more finger-lickin’ filling. First, you’ll need to hard boil 6 eggs. Place them in a pot, cover with cold water about 1 inch above the eggs. Bring the mixture to a boil, cover, remove the pot from heat, and let it sit for 10-12 minutes. Immediately run the eggs under cold water until cooled to the touch. Carefully peel the eggs. Using a sharp pairing knife, cut the eggs in half length wise. Scoop the yolks into a mixing bowl, and arrange the whites neatly on a serving platter. Add all the rest of the ingredients, except the thyme into the mixing bowl. Using a fork, mash and mix up everything until everything’s smooth. While you can always spoon the filling into the egg whites, this filling is a bit on the thinner side than a more traditional version. 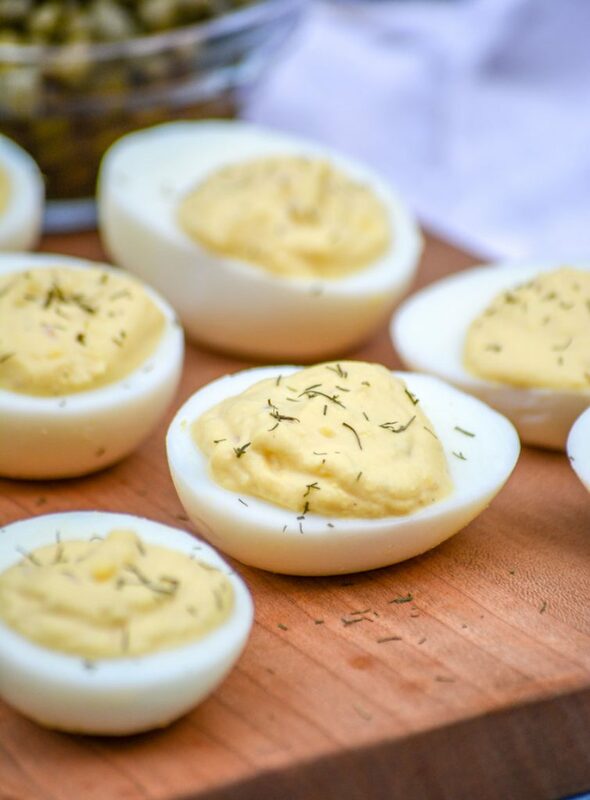 I like a clean, neat look to my deviled eggs- makes them more ‘egg-peeling’. So I add the mixture to a sturdy ziplocking bag, twist the top to seal closed, snip off a corner, and ‘pipe’ each egg white full. 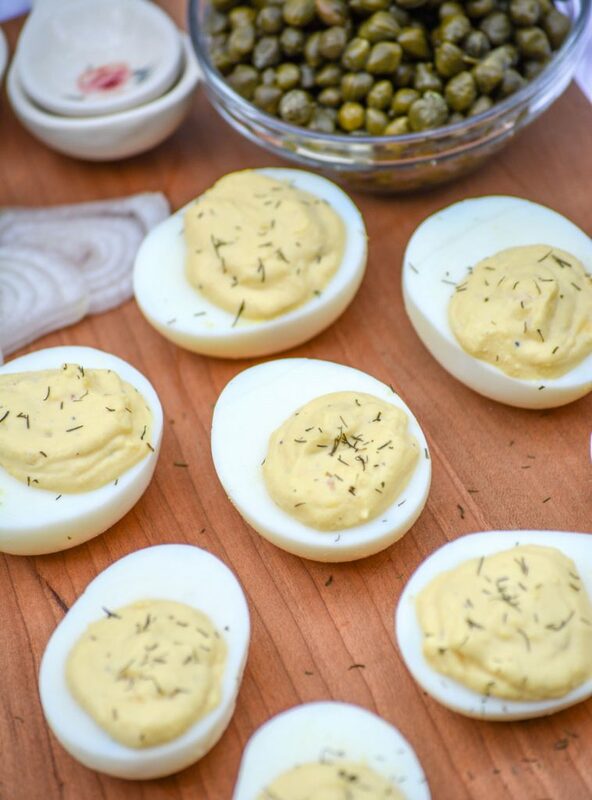 I love that these deviled eggs are easy enough to whip up at the last minute. If you’re a planner though, or need to get started prepping this dish early- that’s easy to do too. Make as instructed, cover, and refrigerate until ready to serve. When ready to serve, pull them out and garnish each egg with a fresh sprig of thyme or sprinkle a pinch of dried thyme leaves out overtop of each egg. 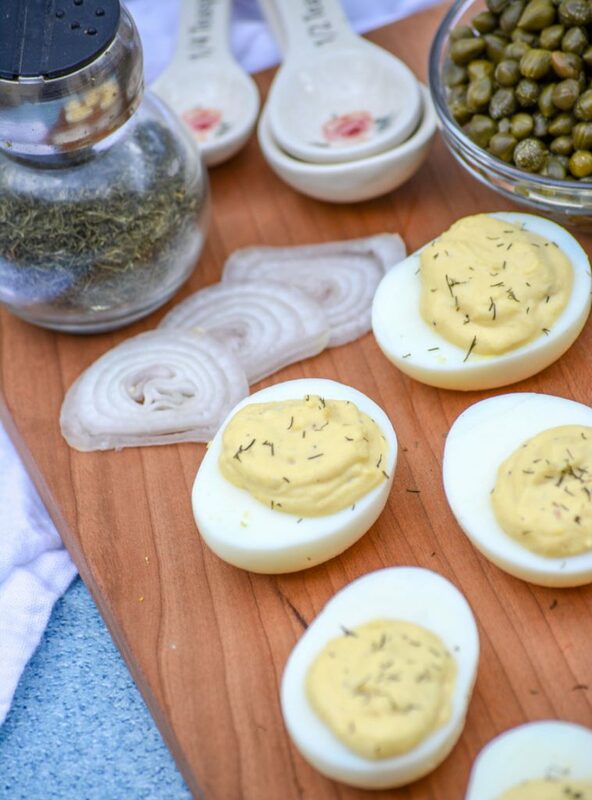 Bring the very best to every get-together with these fancy sounding, gourmet tasting French-Style Deviled Eggs. Don’t be at all surprised, or laugh, when you see people enjoying them with pinky’s out either. 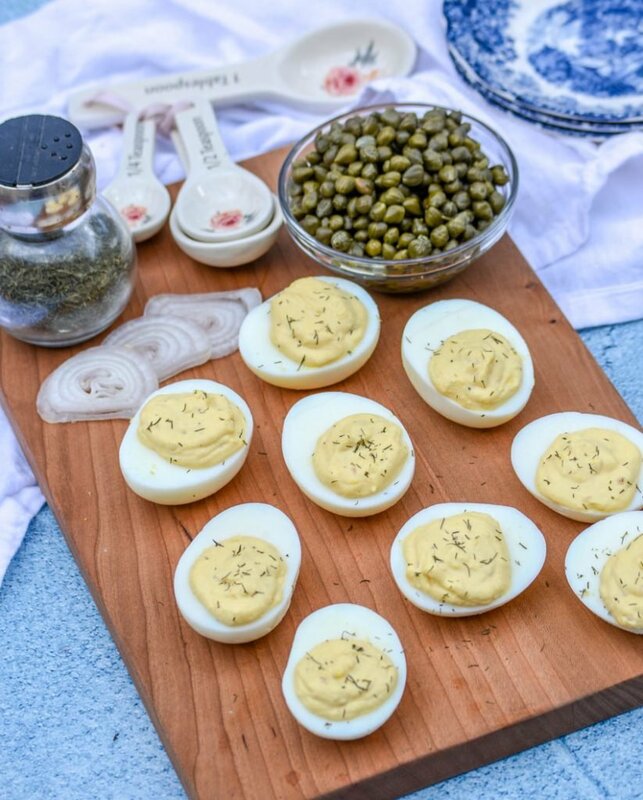 I agree… parties and deviled eggs go hand in hand… and this recipe looks fantastic. We have a local restaurant that now features a deviled egg of the day appetizer… which I think is pretty darn inspired 🙂 Thanks so much for bringing them to Fiesta Friday! A deviled egg of the day?! That is an EPIC idea 🙂 Might have to try my own hand at that this Spring with all our leftover hard-boiled eggs after Easter. You are so right. Take deviled eggs to a party and you come home with an empty plate. These look so good. I’ve never used red wine vinegar in mine but love the punch you probably get. Empty plate. Every. Single. Party. The punch is perfect. I also love making them with some Capers and Caper juice. That briny taste is also addicting. That does sound good! Thanks for the tips. 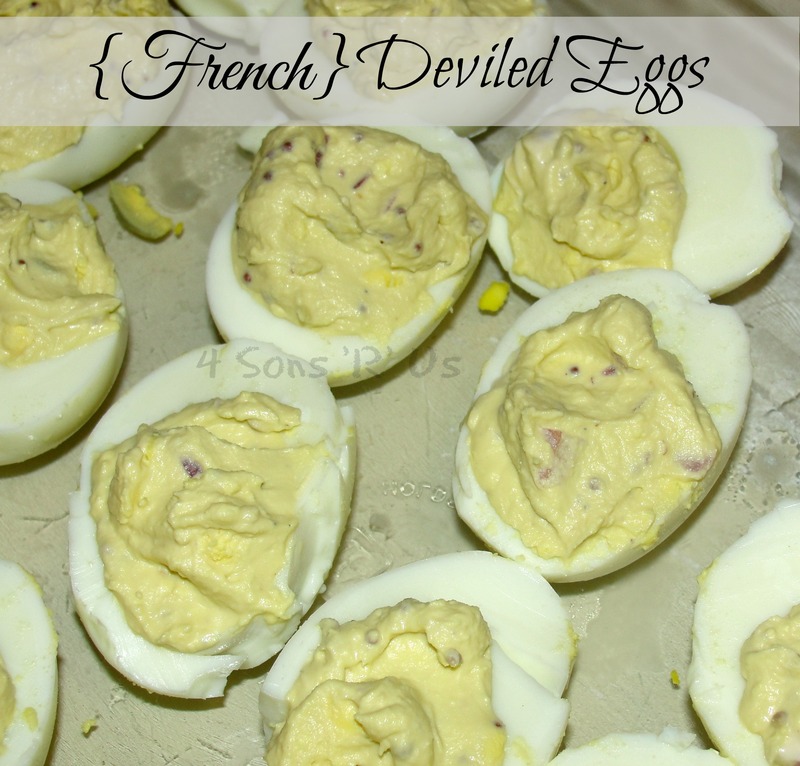 These look so yummy, I’ve never made devilled eggs before but I really should try these! This post did make me chuckle though, you are a brave woman for feeding your boys fart feeding eggyness!! Oh Michelle! You’ve simply got to try your hand at them. They’re delish. They’re also easy and their are loads of recipes for plenty of variety.